in rnds, in chart patt after washing. 18" (45.5 cm) wide and 14½" (37 cm) long. 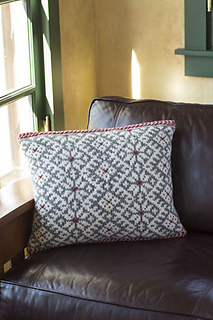 The Snorri Cushion was inspired by the lovely two-color allover geometric patterns and colorful braided borders found on traditional Estonian mittens. Plump and cozy, this cushion is knitted in the round with a decorative braided cast-on and twined stitch border details. The two-color stranded pattern, which is actually deceptively straightforward to knit, is embellished with a few simple duplicate titches. 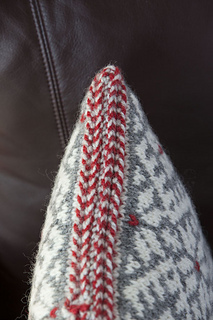 Knitted in a chunky pure wool yarn, this is an easy project that will enable you to familiarize yourself with some classic Nordic mitten making techniques. Traditionally Estonian mittens were made on very fine needles with an extremely dense stitch count, so this cushion is definitely an easier and quicker project to get started on! 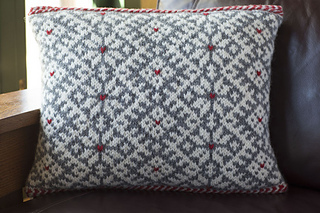 I would recommend making your own cushion pad to go inside the Snorri Cushion. You will just need to cut a piece of linen to the size required, sew up all but a small section of the seams, fill it with pure wool, and sew closed the remaining seam. Needles Size U.S. 9 (5.5 mm) 32” (80 cm) circular (cir). Adjust needle size if necessary to obtain the correct gauge. Notions Marker (m); ½ yd (45.5 cm) lining fabric; sewing needle and matching thread; pure wool for filling; tapestry needle.